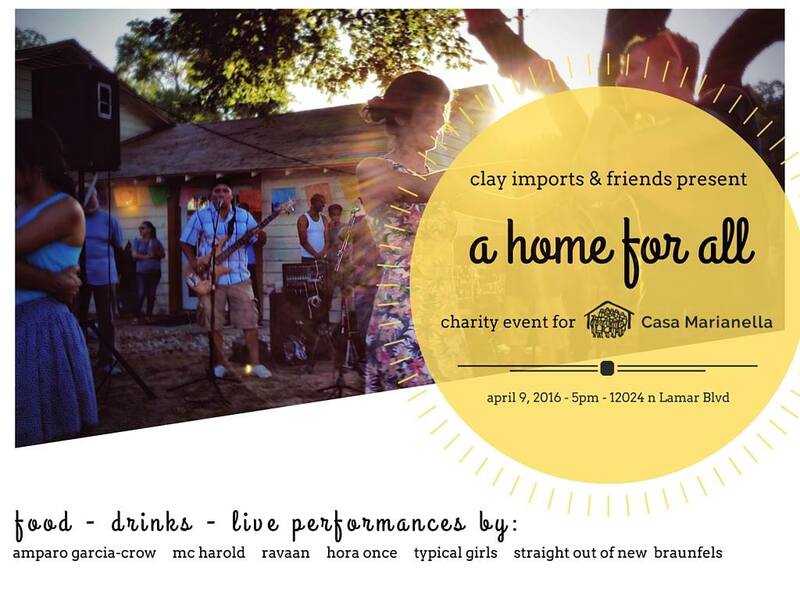 We’re very excited for Clay Import’s fundraiser event for Casa on April 9th! It will be a night filled with poetry, music, dance, and amazing memories. We hope you will join us there. We caught up with our friends at Clay Imports to learn about what motivated them to support Casa’s mission. How did you hear about Casa Marianella? We first heard about Casa Marianella through our friend Daniel, one of the co-organizers of this event. At a recent Martin Luther King march in Austin Daniel met social activist Mark McKee and they discussed the hardships refugees face in Europe and the US. It was Mark who introduced Daniel to Casa Marianella. Daniel was very excited to hear about Casa Marianella because he is active in a similar organization in Germany, but was looking for a way to lend the same support domestically. Because Casa Marianella’s values and efforts are very in line with Daniel’s own, he enthusiastically committed to supporting this organization. He has since shared his excitement with Clay Imports, and we love the idea of supporting a local shelter. What made Clay Imports interested in helping raise money for Casa? At Clay Imports we strive to support diversity, social awareness and the arts through hosting creative events, sometimes with a philanthropic theme. We love bringing people together, whether it is to share music, food or to support a cause. Social involvement brings us closer to our community and we love sharing our space with others! We recognize they value of a home; for this reason we often contribute to the construction of homes in both material and labor and want to continue to work regularly with Austin-based homebuilders and homeowners as we support our community. Why do you think community involvement with nonprofits is so important? Nonprofit organizations are in constant need of support, both in financial assistance and manpower, in order to pursue their mission. Casa Marianella serves and shelters more than 500 individuals from around the world annually. This overwhelming task is only possible through the participation of the many partners, donors, and volunteers who support this non-profit emergency shelter. Engaging standing members of the Austin community with newly-arrived members leads to a diverse understanding of our community. The event will be an informal, eclectic gathering of family and friends, new and old – for a night of live poetry, live music, improvised rap comedy, Persian dancing & more! We will have food and non-alcoholic beverages onsite for guests to enjoy, as well as beer donated from local partners,4th Tap Brewing Cooperative! This is a great opportunity for folks to enjoy some unique entertainment, delicious food and good company, all in the artful setting of our locally-owned and operated tile shop. What do you hope is the impact from the event on the community? We hope to hope to foster empathy and understanding toward newly-arrived immigrants by raising awareness of Casa’s presence in the Austin community, letting people know about the services Casa provides, promoting volunteerism for Casa, and by raising funds so that Casa to continue to provide essential services to its residents. Click HERE to view Clay Import’s fundraiser details! See you there!